Selecting a new credit card could be a difficult decision. Each card issuer has a host of products and it is not easy to determine which card is the best one. The benefits could include low or nil joining fees, attractive discounts on certain products, or a generous rewards program. On the other hand, the fine print of the terms and conditions can often give you a nasty surprise when you least expect it. Before you finalize on a credit card, you may want to consider the ways in which a new card could harm your financial well-being and even spoil your credit record. Using some of the information listed below, you would be better informed about what to look for when getting a new card. Remember that a small error or misunderstanding on your part may result in large financial penalties or a lower credit score. 1. Understand the terms before you sign up. Each credit card has a key selling point that gives it a unique appeal. A card that is co-branded with a particular store would usually offer a high level of reward points while a card that is co-branded with an airline would make the card holder eligible for additional miles. Many of these cards would make up for the extra cost of these offers by some other means. One of the usual practices followed by credit card issuers is to apply a higher interest rate to outstanding balances. In other instances, you may be eligible for a shorter credit period compared to other cards. A useful rule to follow before acquiring a new card is to study its terms and conditions carefully. The specific areas to watch out for are annual fees, balance transfer fees, how long an introductory offer will last, and the type of rewards available. 2. Signing up for too many credit cards. Having multiple cards is usually not a problem. In fact, it can even be an advantage. If you use several cards, your credit utilization ratio will be lower, a point in your favor when your credit score is being calculated by the credit bureau. There are many people who manage several cards successfully. They keep a track of due dates and the amount that they have spent on each card, and they ensure that they do not delay a single payment. But most of us are not as well organized as this. If you have four or five cards, it is inevitable that you will forget to make the payment for one of them occasionally. This could result in additional interest, a late fee penalty, and a tarnished record. There are other disadvantages of having too many credit cards. When you decide to buy a home and approach a lender for a mortgage, the total of your credit limits on all your cards may be used for calculating your debt-to-income ratio. The lender would need to take into account that possibility that you could max out all your cards after taking out a mortgage. This could severely restrict the amount that you are eligible to borrow. If you do decide to maintain several cards, keep the implications in mind. 3. Closing down an older card to get a new one. You may come across a new credit card offer that is simply too attractive to turn down. But you may already have several cards and find it very time-consuming to manage them all. In such a situation, the logical solution is to cancel an older card and replace it with a new one that offers better features. But before you do this, keep two important factors in mind. One, your credit score is partly dependent upon the length of your credit history. Closing down your oldest card will have a negative impact on your credit score. Secondly, “new credit” also impacts your credit score. When you apply for a new card, your score will decrease a little. While this could be acceptable, it is strongly inadvisable to apply for several new cards simultaneously, especially if your credit history is not very long. As a general rule, a credit card with a liberal rewards program will carry a higher interest rate on outstanding balances. The interest rate that a card carries should be one of the most important factors to consider before making your choice. Many people do not pay much attention to the interest rate as they have no intention of ever carrying an unpaid balance. This may not be the correct approach to follow as a medical emergency or some other sudden unplanned financial requirement may force you to pay only the minimum amount due when you receive your monthly statement. It may be a good idea to have one plain-vanilla card with a low rate of interest which you can use in an emergency. You could adopt a strategy of carrying forward a balance only on this card while paying off the entire amounts due on all other cards every month. When comparing interest rates between various credit card options don’t forget to look at the time-limit for low or zero-rate offers and also at balance transfer fees. Many cards are promoted by stores that sell high-value items like furniture. An introductory offer on the card may entitle you to an initial interest-free period. If you sign up for the card you can buy furniture and pay for it over a period of several months without incurring any interest at all. If you decide to accept this offer, remember that if you do not pay the entire amount within the stipulated interest-free period, you could be charged interest retrospectively. Don’t sign up for a new card without understanding all the possible implications. 5. Will you pay off the entire balance every month? When you are selecting your new credit card, it is essential to understand the procedure that the card issuer follows for charging you interest on your outstanding balance. For example, if you spend a sum of $1000 on your card in a billing cycle, what is the minimum amount that you will be required to pay when you receive your billing statement? One way this is determined is to calculate it as a percentage of the balance. If the minimum amount to be paid is 2%, you would need to pay $20 (2% of $1000) by the due date. While you should use this facility as little as possible, it is essential to understand how it will work. Keep in mind that credit card companies charge very high rates of interest and you should expect to pay at least 12% annually or even more. Additionally, you could become liable to pay a late payment fee. If you add the interest, late payment fee, and other charges, it could total up to a large amount. Before selecting your new card, spend a little time to understand the nature of charges that you will be required to pay if you use the facility of paying the minimum amount instead of the entire balance. But as far as it is possible, you should pay the entire outstanding balance well before the due date every month. Carrying an outstanding balance on your card is a financially imprudent decision and one that must be avoided. 6. Ignore the cash advance feature. You should never use your credit card to withdraw cash from an ATM machine. It is possibly the worst financial decision that you can ever take. If you do use this facility that your new credit card offers, you will incur several types of costs. Upon withdrawing cash, you will immediately be debited with a charge which would usually be in the range of 2 - 4% of the amount that you have taken as an advance. In addition to this, many credit card issuers charge a rate of interest that is higher than the standard rate. The negative implications of taking a cash advance do not stop there. It is common for the credit card company to first require you to pay off your outstanding balances on regular purchases before it will allocate your payment towards the cash advance. This will result in paying the higher rate of interest applicable on the cash advance for a longer period of time. 7. Getting a new card because all your other cards are maxed out. A credit card in not a source of income. Unfortunately, many people use their cards knowing that they are in no position to pay the outstanding amount at the end of the month. Even worse, some people utilize their existing cards to the maximum amount possible and then get a new card to carry on spending. Obviously, this approach cannot work for long. Not only will you incur massive interest costs and damage your credit score, you will find it extremely difficult to get out of the debt trap that you have created for yourself. 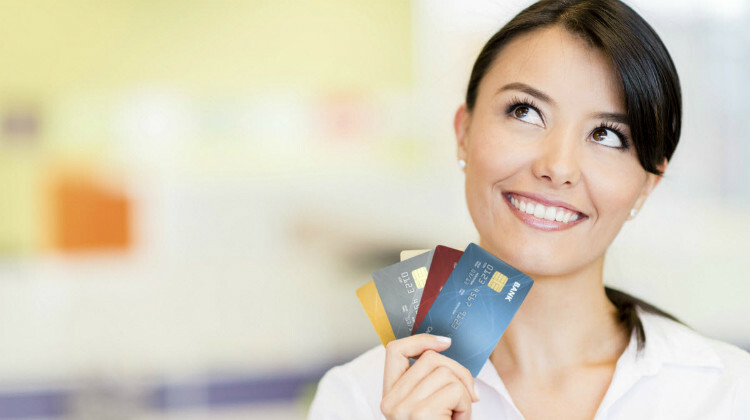 Your choice of a new credit card should be based on your specific requirements. If you are going to regularly carry an outstanding balance, it makes sense to select a card that has the lowest interest rate. A frequent flyer would be attracted to a card that offers the best miles program. Regardless of the type of card that you finally opt for, it is advisable to take a measured decision after carrying out in-depth research on several cards that meet your basic criteria and then selecting the card that best fits your needs.